Top : Designers : Gilbert Creative Group Inc.
Gilbert Creative Group is a full service marine design firm located in the Okanagan Valley of British Columbia, Canada. Our work spans three decades and is a major force in the pleasure boat industry today. Our clients have reaped the benefits of leading-edge, clever and innovative designs, elevating their brands to the forefront of the marine industry. Customers also continually achieve greater market share and profitability. Web Site Snapshot: If available, above is a snapshot of the Gilbert Creative Group Inc. web site at http://gilbertcreative.ca as it appeared when this site was added to the directory or last verified. Please Note that Boat Design Net has no involvement with the above web site; all content and images depicted in the above thumbnail are the property and copyright of Gilbert Creative Group Inc. unless otherwise noted on that site. 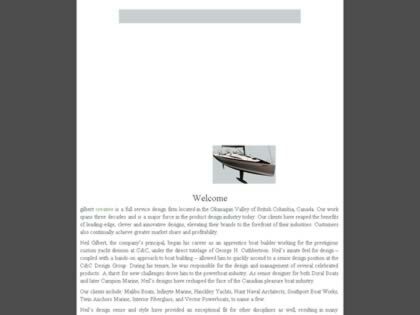 Description: Gilbert Creative Group is a full service marine design firm located in the Okanagan Valley of British Columbia, Canada. Our work spans three decades and is a major force in the pleasure boat industry today. Our clients have reaped the benefits of leading-edge, clever and innovative designs, elevating their brands to the forefront of the marine industry. Customers also continually achieve greater market share and profitability. Visit Gilbert Creative Group Inc.